Sorry guys this is going to be a bit of an essay. Last year I got this bike as a winter resto and it was not running well. Transpired that the jetting had been severely messed with. With the help of some of the clever guys on this forum I was a able to source a second set of3TJ carbs and some new seals. I then returned the carbs to original jets and settings. The net result was the bike ran and I was able to do a few miles though I never balanced the carbs as I intended doing it when I put the bike on the road this year. Over winter I have pretty well rebuilt and refurbed the majority of the rolling chassis as it was a state - new bearings, paint seals etc etc. I have got the bike pretty well back up together but I am having trouble starting it. It fires on 1 & 4 but will not ignite on 2 & 3. So I bought some new spark plugs having noted that the quality of the spark generally is quite poor on all cylinders but it does look weaker on 2 & 3. Put the new plugs in and still the same problem. I can't get it to start, exhausts 1 & 4 are getting warm when I try to start it but I can't get 2 & 3 to fire so it won't run. Have disconnected and reconnect the wiring harness during the refurb. How do I check the coils ? 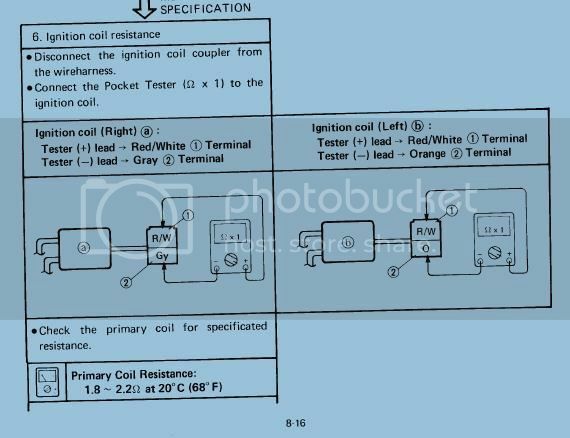 How do I check that I am getting the correct voltage to the coils? Can I replace the HT leads - they look like they a bonded into the coils? 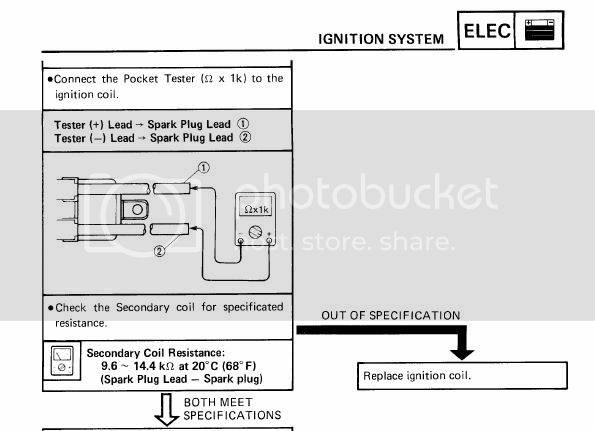 How do I check the igniter? Does anyone have a clue - I have reached a blank! Firstly can you definitely rule out valve clearance and compression issues? Swap over the connection plugs and the HT leads to see if the weak spark/none firing follows the coil pack. Why do you suspect the HT leads? Unscrew the caps and cut the leads back when you swap coils. If you try to start it in a dark garage,you can usually see or even hear the crack of HT leads tracking to earth. If you hold each lead firmly whilst starting, I can guarentee you will tell if the lead is tracking to earth. The leads are potted to the coil but may be cut away and carefully dug out of the coils and replaced;inside is just a spike. Mastic or 2 part adhesive can be used to secure the new copper cored lead. You can get lead joining pieces but they are bulky. Use the old rubber armouring on the new lead. Replacement coils are cheap enough though. I will hunt through some manuals to try find the coil specs. A red box doth not a Snap On make. I'd suspect the coil or the supply to it because 1and4 fire from a single coil and 2and3 from the other. Have a look at the low tension wires and make sure the crimps are OK. As Will says swap the low tension wires and have a look at the spark. 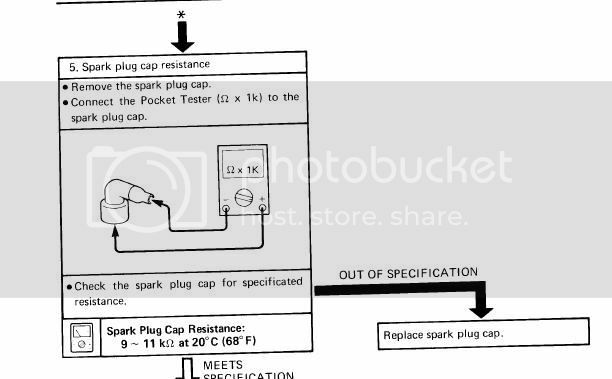 If the spark improves Clip back the HT lead but if that has no effect simply change the coil for a similar one. Chaps thanks for your help and info. I checked the compression when I first got the bike and it was better than ok. The guy I bought the bike off told me the valve clearances had just been checked and they were fine!!!! Guess its time I checked them. As my four days for getting the bike up and running have disappeared in a flash I will look at the bike during the evenings this week and work through all the electrical checks. I am sure it is a connector that is giving me the grief. I wish I had balanced the carbs while the bike was running. Once again thanks for your help. I will report back. Mang,balancing carbs will not stop a bike running,it may run uneven but it will run. If the compression is good and the clearances were done recently; you are correct in suspecting electrical issues first. Remove all the plugs and the plug caps,try each lead about 5/10 mm from earth whilst using starter. You should have a cracking blue spark at each lead. Be aware; even a good battery turning the motor over will not produce a good spark if battery voltage reduces to 10v, if plugs are inserted with TCI ignition. Jump starting poor starters with a big battery is definitely the way forward. Last edited by willandrip on Thu Apr 04, 2013 7:20 pm, edited 1 time in total. Your points are noted - I have an old 4x4 with a battery as big as house so I will try that. I had a similar problem with the Kwak turbo that the voltage generated was too low to fire the DFI - it was actually a few points of a volt short but it made the difference. Still if this weather continues on we won't be troubled by much biking this summer. Checked the battery when the starter motor was throwing over the engine and it was 12v plus a bit. The Primary coils measure approx 2.5 ohms I think this is probably within tolerance as its such a low resistance to measure with a budget multimeter. I may be wrong in this hypothesis so let me know your thoughts. Having checked the plug caps, two were within spec and two (from cylinders 2 & 3) registered no resistance at all. I may be getting somewhere. got two loan plug caps off a mate so will update.